Hello all! I wanted to start a fun ongoing series to record my favorite things from the last couple weeks and share them with you! Winter Brights! It may be winter still, but the weather has been more like spring! While it's not quite time to bring out the summer wardrobe, I have been wanting to break out from my normal winter wardrobe that is stereotypically dark, wool, and heavy. Luckily, I also have some spring-colored long-sleeved shirts and sweaters that are brighter hued to perk up the remaining winter days. I've been living in this cozy pink sweater for the last several weeks, as seen in my Instagram. The Oscar movies! This year I've seen almost every Oscar nominee for Best Picture, so I'm pretty pumped to cheer for my favorites: "Lady Bird" and "I, Tonya" on March 4th during the Oscar Ceremony- basically my Super Bowl! The Last Mrs. Parrish! 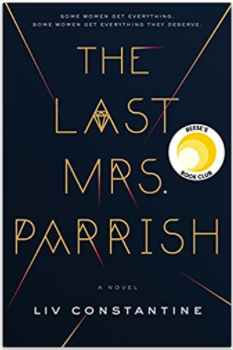 It was finally my pick in book club and The Last Mrs. Parrish did not disappoint! I love a thriller set in a wealthy community- the perfect mix of glam and drama! It's also a page turner and you can read it cover to cover over a rainy weekend! Armchair Expert with Dax Shepard- I'm really enjoying this new podcast from one half of one of my favorite celeb couples! I've always loved Dax Shepard and Kristen Bell and find them hilarious but also really heartfelt and authentic. In this podcast, Dax conducts long form interviews with his celebrity friends like his wife, Jimmy Kimmel, his TV wife (from Parenthood!) Joy Bryant, Ashton Kutcher, and more to come!